Would like to stream to Facebook live on pages that are managed. I have purchased the iphone version for wirecast. But continually get the following when connecting: rtmp server did not respond to a connection request. 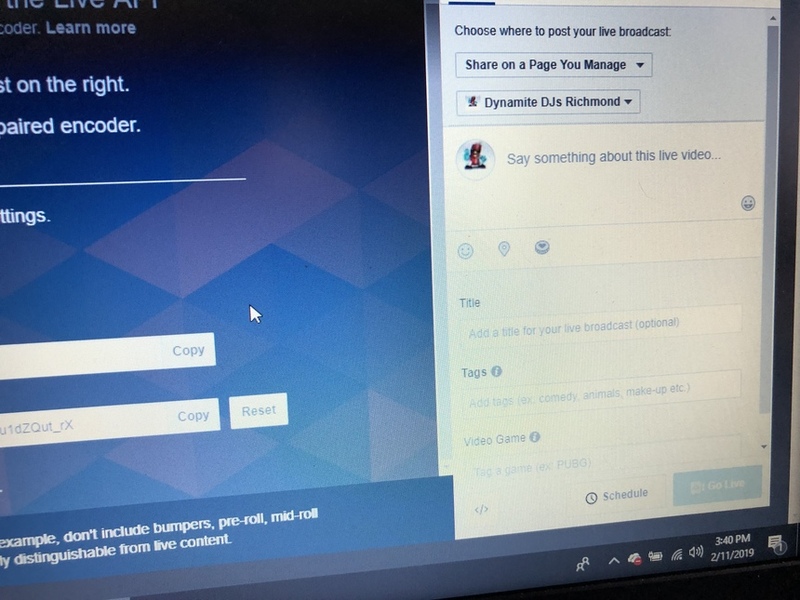 On your facebook page (computer) go to "Publishing tools" and select "videos"
Click the "+ Live " button to create a new stream. You'll get a pop-up button with the credentials you'll need for the wirecast go app (you'll need the "Seperate Fields" part). Launch the Wirecast Go app on your IOS device, hit the red record button and under RTMP servers choose " Add New Server". You don't need to enter any lusername of password - the stream key is basically the "secret" that handles whether you have permission to stream on the page. Click "add" to save the stream in the app, and hit the stream name to start broadcasting to the new server. On your desktop computer click the "Preview" button in the right bottom corner of the pop-up window - this will show the feed coming from the wirecast app in a preview window. You can add video tags and a title to your stream. Once you're ready to go live, confirm by clicking the "Go Live" button. 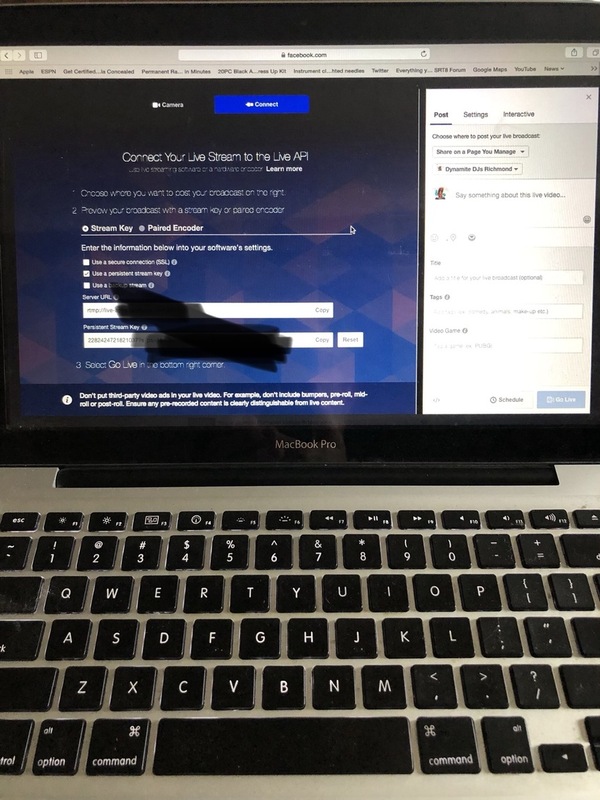 Although facebook doesn't allow pages to stream live video from their phone apps, this method allows you as a page owner to broadcast live video, and you'll get the same benefits as personal users- being that your followers will receive push notifications when you go live etc- very handy for getting a lot of viewer on board in a short amount of time. Facebook specifies that your stream key will only last for 24hours and you need to go live within 4 hours after hitting the preview button. Other than that, we tested this with an ipad mini and had a very steady stream and video latency was only a couple of seconds (depends on your broadband connection though). If you're still struggling with getting your feed out, check that your Firewall allows RTMP streaming- some ports may have to be opened up (I believe port 80 and 1935 for rtmp - but you may want to double check that...) or switch off wifi and test on 4G instead. Filip De Clerck any comments or instructions to Paul D ? Paul, can you check that you have created a fresh key and doublecheck for typos (it appears to be case sensitive and make sure you don't switch 0 and O's - I made that mistake before)? The stream Key secret only remains valid for 24h and you also need to go live within 4h of previewing your content. Filip De Clerck Alguien me puede ayudar lo agradecería, como puedo capturar la cámara de mi iPhone 7plus a la trasmicion de mi ordenador ? Max Álvarez En Wirecast 8, envíe el enlace Rendezvous al iPhone con el programa Wirecast Go instalado. None of this works! There is no preview button anymore! Joe Bowman Please show me how you're setting this up in Wirecast Go. 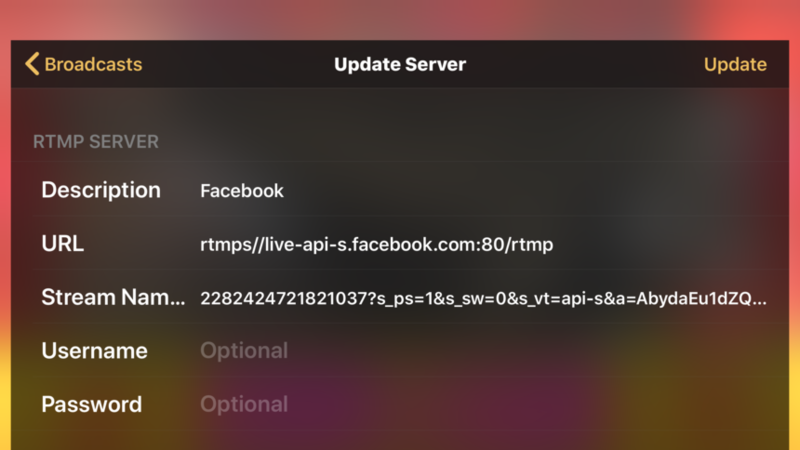 For example, to stream to Facebook you may need to use RTMPS rather than RTMP as the URL. Facebook is changing things as obviously Wirecast Go hasn't changed anything. Streaming works fine. You can see the preview in the middle and the stream stats on the bottom before I go live. CraigS I don’t get any of that. What browser is that? Joe Bowman RTMPS may need to be port 443 so it might not be getting through. I used Safari (on Mac of course). As you can not only do I get a preview, it gives me data rate and frame rate. CraigS I’ve tried 443, 80 and 1953 I think it is. None work on WiFi nor LTE or 4g. I guess I’ll drag out the old MacBook and try it on that. Joe Bowman you could try RTMP which should still work for the time being. CraigS yeah, that didn’t work either. Gonna get my mac out of my van and try. CraigS well as I stated before, using a tablet with chrome and safari (iOS is updated so are the two browsers) and on a Windows 10 laptop and a Windows 7 using multiple browsers there is no preview button. I’ve seen the videos online of others browsers and they have a preview button. Joe Bowman Don't use a tablet browser. It should work on Windows 10. Try Firefox. I tried Mozilla Firefox yesterday, no preview button. Getting the same on my Mac. No preview button. Ive scrolled up and down. Not there!